Siesta key beach weddings: How to plan the best once-in-a-lifetime wedding event. Your detailed one-stop guide to planning a Siesta key beach ceremony. Why is Siesta key a popular beach wedding destination? The #1 Wedding Package option is? Siesta key public beach is the most requested beach ceremony venue of all Sarasota Florida area beaches. With its’ cool white powder sand combined with an estimated 300 yard ( 3 football fields ) wide beach, Siesta key beach easily accommodates even the largest of weddings. We provide a PDF Map of Siesta key beach and its’ wedding area to all of our clients. Fact: Siesta key public beach hosts hundreds of beach weddings every year. Couples arrive from not only every state; Siesta key beach serves as THE beach wedding choice for many international brides & grooms as well. Sarasota Wedding Ideas Beach Wedding Company is located in Sarasota Florida and open Monday thru Saturday from 9 am until 6 pm, and Sunday 12 pm till 5 pm. Contact us for help planning your Siesta key beach wedding at 941-726-6654. As with every wedding, your “venue” is first on the list of items to secure. 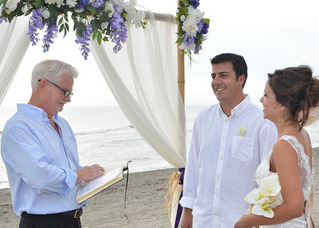 With beach weddings, your spot on the beach will be your ceremony venue. There are different areas or spots at both Siesta public beach and Turtle Public beach where you can choose to setup decorations and chairs for your ceremony, and that brings up the following question. Where are the best Siesta key beach ceremony spots? The “which wedding spot do we choose” answer is more complicated than it should be. Everything changes and the best spots in the summer months may change with the new season or even the day of the week. Tip/Guide: The Siesta key drum circle is an every Sunday evening event and directly effects both my choice of public beaches wedding locations, as well as ceremony location if the wedding is to be at Siesta public beach. If you’re going the DIY beach wedding route know that there are options, research them and choose wisely. There are 3 main beaches on Siesta key. 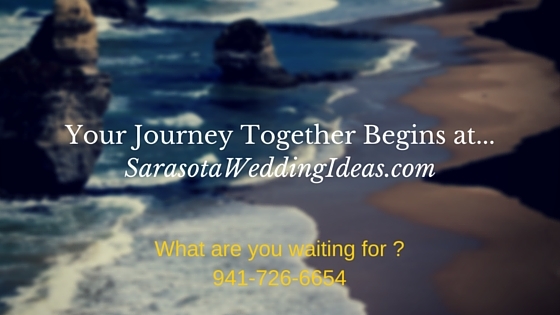 Contact us if you want experienced help planning your Siesta key beach wedding. Siesta key public beach is the most popular of the public beaches. Crescent beach is the same sand as Siesta but is considered to be a “semi-private” beach area. Semi-private beaches in the state of Florida are public beaches from the water front up to the high-water or high-tide area. 2.) Crescent beach (semi-private) Note: There are NO totally private beaches in the State of Florida, per law. One of the best things about beach weddings is that they’re supposed to be much more casual, relaxed and a whole lot more fun than those fancy-schmancy expensive ones. Many couples love Siesta key beach just because they can really dig their bare feet into the powder soft sand at Siesta. Other beaches don’t even come close to the soft sand feeling at Siesta, that feeling between your toes is unbelievable. After performing so many beach weddings, it seems that when people literally ‘kick-off their shoes,’ a sense of calm begins. I’m not sure exactly how or why it works this way, but it does… and it’s great! So, when you’re planning that beach wedding consider making it a “Barefoot” affair. I think you’ll be glad you did. Siesta key beach wedding packages usually combine a 2 or 4 post bamboo arch with other wedding decorations, chairs, wedding photography, processional / recessional music and more. We believe that our wedding packages are beautiful, and very affordable compared to other beach wedding companies. See our wedding ceremony packages and designs for yourself. You’re our judge and jury and we understand that. Siesta key wedding package options can be seen here. Their are a few additional package options (not listed) which are available upon request and priced separately. Contact us for option pricing. 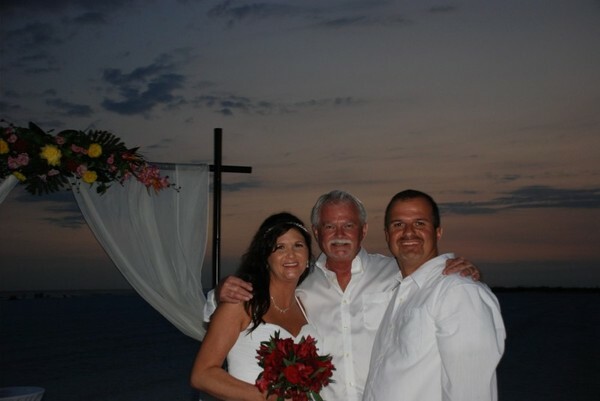 We do wedding ceremonies for all couples, elopements and vow renewals at Siesta key. Last minute weddings are a favorite, just contact us to book your wedding ceremony. We have both male and female ceremony officiants & ministers available for your wedding or vow renewal event. Look at the drop down menu under the Officiants Page for popular ceremony packages or call for more information to 941-726-6654 or use the on-site Contact form. Siesta key beach wedding officiant. Vow renewal celebrant Also! The 5 most popular & requested ceremony options are: wedding photography, the sand ceremony, tiki torches, music and fresh rose petals. Wedding photography is the most popular option requested by couples planning their ceremony. Tip: We do a lot of small beach weddings and vow renewals where 30 minute photo shoots are a perfect fit. Couples always have an additional upgrade option to a 1 hour photo shoot if this what you want. After the wedding photo shoot the photographer will “edit” the best photo’s. The edited photos are then transferred electronically online, or installed onto a CD which is then mailed to your home address. You’ll have full rights to the photos to print out, email or post on Facebook and Instagram. The majority of beach wedding couples use a local restaurant as their reception venue. Having a restaurant be your reception venue is easier and much more affordable than renting a pricey reception venue or banquet hall and having to pay to have your food and drinks catered. It’s also more affordable that having a beach reception plus you’ll be able to get out of the hot Florida sun. Believe me, you start getting dehydrated after only about 30 minutes when you’re on the beach. Can I Have a Wedding Reception on the Beach? The short answer is yes, in some defined beach locations. For most Siesta key beaches the answer will be no, you cannot have a reception on the beach. Tip: Plan to provide a “Champagne Toast” or “Cake and a Toast” on the beach, with or without a wedding reception to follow. Other ideas would be to just have a restaurant get together, food apps and drinks, casual style, flip flops only! Another casual idea would be for outdoor barbecue with beer & wine. There are a couple affordable venues, indoor & outdoor, that are available to rent and we provide the venue planning at these locations by request. Please understand that beach receptions can be very expensive. Food and drinks have to be cooked off-site then transported and setup on the beach with tables, tents, chairs and much more. All of that takes a lot of man-power, and that equals money. If this is what you would like we have some great catering companies that we are happy to recommend to you. Beach receptions can get very expensive very quickly, and it’s just another good reason to head to a local restaurant instead. If your thinking about a beach reception on one of the beaches of Siesta key, consider the fact that 99% of couples having a beach weddings choose a restaurant to host their reception. Wedding Reception Ideas by Sarasota Wedding Ideas – Siesta Key Village Restaurants. Crescent Beach is a semi-private beach fronted by a few resorts and a lot of condominium residents. Some resorts on Crescent Beach accommodate couples wishing to hold a semi-private beach wedding. Tents might be allowed on the beach for a reception at a select few of these resorts. Again, be aware and prepared to spend thousands for your beach wedding reception. Tip: Save $$$ – Most Siesta key & Sarasota resorts & hotels will give an additional 10% off when you book 10 rooms minimum for your friends, family and guests to stay. This “DIY” information is for couples that live locally and would want to build their own wedding arch and other decorations. Destination wedding couples would really find it next to impossible to go the DIY route. Some of our beach wedding couples like the idea of building their own “wedding arch” and call me to officiate and photograph their wedding which is a great way to save money. DIY couples will find that it does take a bit of skill and artistic design ability to build a good looking and functional beach wedding arch. Add to that, the money that needs to be spent on bamboo poles, fabric material, fresh or silk flowers and a few other items. In all, it could take a couple of weekends to build your own beach wedding arch. Below is a DIY bamboo arch where the couple requested my officiant services and sand ceremony. Tip: If you’re building the arch make sure it is firmly and deeply set into the sand. Siesta key public beach wedding permits are required for every public beach wedding that will be setting-up any kind of wedding decoration, such as a bamboo arch, chairs for guests, tiki torches, sand heart decoration, etc. Permits are paid for by the hour, with a 1 (one) hour minimum required. 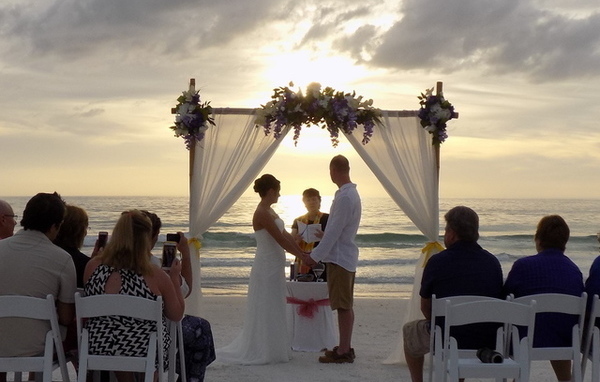 Guide: A Siesta key beach wedding with an arch and 20 or more chairs typically requires at least a 2 hour permit, with a 3 hour permit allowing for a more relaxed, un-rushed wedding with plenty of time for after ceremony pictures with family and friends. Tip/Guide: Permits must allow for the setup and removal of all decorations, wedding arch, chairs, music etc. Depending on the decoration package, setup and removal could take only 1/2 hour, or as long as 1 and 1/2 hours. We obtain all wedding permits as a customary part of our service for our clients. We are required to have the actual permit on hand should the need arise. Sometime’s mistakes happen and there are double bookings for the same spot. The permit fee’s are an additional cost to our beach wedding packages. Contact us with any questions regarding your Siesta key beach wedding. Guide/Be Aware: The information below is for “Sarasota County.” Other Florida counties may have different marriage application requirements. Please check what the marriage application requirements are with the clerk of the court in the county where you will be obtaining your marriage license. Here is a link to: Sarasota County Clerk of the Court for Wedding & Marriage License Information. Florida Marriage License Clerk Offices in every Florida County: List of Florida Clerk Office in Every County.